Item #CH-ROPE-050-16: 16" long 2.5mm wide Sterling Silver Rope Chain. Lobster claw clasp. 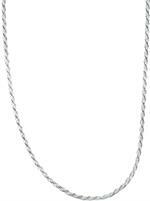 Item# CH-ROPE-040-16: 16" long 2mm wide Sterling Silver Rope Chain. Lobster claw clasp. Item #QG-QBR022-16: 16" long Sterling Silver 1.5mm 8-sided diamond cut box chain with spring ring clasp. Item #QG-QBX022R-16: 16" Rhodium-plated Sterling Silver 1.1mm box chain with spring ring clasp. Item #QG-QDC020R-16: 16" Rhodium-plated Sterling Silver 1.5mm Diamond cut rope chain with spring ring clasp. Item #QG-QSN030-16: 16" Sterling Silver 1mm snake chain with lobster claw clasp. Item #QG-QSP050-18: 18" Sterling Silver 1.75mm spiga chain with lobster claw clasp. Item #QG-QBR022-18: 18" long Sterling Silver 1.5mm 8-sided diamond cut box chain with spring ring clasp. Item #QG-QBX022R-18: 18" Rhodium-plated Sterling Silver 1.1mm box chain with spring ring clasp. Item #QG-QSQ040-18: 18" long Sterling Silver 1.25mm square snake chain with lobster claw clasp. Item #QG-QDC020R-18: 18" Rhodium-plated Sterling Silver 1.5mm Diamond cut rope chain with spring ring clasp. Item #QG-QSN030-18: 18" Sterling Silver 1mm snake chain with lobster claw clasp. Item #QG-QSQ030-18: 18" Sterling Silver 1mm square snake chain with lobster claw clasp. Item #RC-AGRR0YP40-20: 20" long 2mm wide Rhodium-plated Sterling Silver Rope Chain; Lobster claw clasp. Item #QG-QSP050-20: 20" Sterling Silver 1.75mm spiga chain with lobster claw clasp. Item #QG-QBR022-20: 20" long Sterling Silver 1.5mm 8-sided diamond cut box chain with spring ring clasp. Item #QG-QBX022R-20: 20" Rhodium-plated Sterling Silver 1.1mm box chain with spring ring clasp. Item #QG-QSQ040-20: 20" long Sterling Silver 1.25mm square snake chain with lobster claw clasp. Item #QG-QDC020R-20: 20" Rhodium-plated Sterling Silver 1.5mm Diamond cut rope chain with spring ring clasp. Item #QG-QSN030-20: 20" long Sterling Silver 1mm snake chain with lobster claw clasp. Item #QG-QSQ030-20: 20" Sterling Silver 1mm square snake chain with lobster claw clasp. Item #SBC-58009N-SL20: 20" Samuel B. Collection Sterling Silver 2.5mm Tulang Naga chain with hook clasp. Item #QG-QSN030-24: 24" 1mm Sterling Silver snake chain with lobster claw clasp. Item #CH-ROPE-050-24: 24" long 2.5mm wide Sterling Silver Rope Chain. Lobster claw clasp. Item #CH-ROPE-040-24: 24" long 2mm wide Sterling Silver Rope Chain; Lobster claw clasp. Item #QG-QSP050-24: 24" Sterling Silver 1.75mm spiga chain with lobster claw clasp. Item #QG-QBR022-24: 24" long Sterling Silver 1.5mm 8-sided diamond cut box chain with spring ring clasp. Item #QG-QBX022R-24: 24" Rhodium-plated Sterling Silver 1.1mm box chain with spring ring clasp. Item #QG-QDC020R-24: 24" Rhodium-plated Sterling Silver 1.5mm Diamond cut rope chain with spring ring clasp. Item #QG-QSQ030-24: 24" Sterling Silver 1mm square snake chain with lobster claw clasp.